One of my challenges as a Nutritional Therapist is getting people to think outside the box for what they can have for each meal of the day. Homemade broth for breakfast certainly fits the bill. This is especially important if we’re removing things like gluten or grains for a while. Because outside of eggs, there’s not a whole lot left, at least in the standard American breakfast landscape of cereals, muffins, croissants, pancakes, waffles and bagels. Also, keep in mind that although broth for breakfast isn’t common in America, it is in many other places around the world, especially Asia. When I traveled to Burma, I started every morning with a fish-broth based noodle soup called mohinga (trust me, it tastes better than it sounds). And when I was in Thailand, I often had a light breakfast of rice in broth (known as a “congee”) with different herbs and seasonings. Since then, broth for breakfast has become a standard part of my breakfast repertoire, especially in the colder months. Warm up some broth. Add in whatever you want – some greens, some chopped garlic, poached some eggs in there, maybe throw in some leftover chicken or sausage, spice it up with salt and pepper or soy sauce. Boom. Breakfast is ready in five minutes. As a Nutritional Therapist I hear this all the time: “But I’m not hungry in the morning.” Many people don’t do well with heavier protein-based breakfasts for many reasons. They often skip breakfast as a result but regret it a few hours later when they’re starving at work and have nothing prepared. If you’re one of those people who get nauseous at the thought of eggs and bacon in the morning, consider having broths for breakfast instead. They’re easily digestible and won’t make you feel bloated. But if you’re like me and need a bit more protein…. 3. You can still have eggs! Broths don’t have to be light. If you’re one of those that thrive on heartier breakfasts, broths can still do the trick. Adding a good protein and some starch like rice or potatoes can make for a very filling meal. And the easiest way to add some quick protein is to add some eggs. They work well in almost any broth. You can poach ’em right in the broth and they’ll cook in just a few minutes. 1-2 cups broth of choice – chicken, beef, fish, pork, etc. 1. Bring broth to a simmer. 2. Add in eggs and simmer a few minutes until whites are cooked but yolks are still soft and runny. 3. Top with parmesan cheese, parsley and salt and pepper, to taste. 1. Bring broth to a simmer and add in ginger, garlic and simmer a few minutes, longer if you have time, to further infuse garlic and ginger flavor. 2. Add in eggs and kale and simmer a few minutes until eggs are cooked and kale is thoroughly wilted. 3. Season to taste with soy sauce or fish sauce. 1. Bring broth to simmer. Remove about a ½ cup to a bowl, mix in tomato paste and return to the broth, thoroughly mixing. Add a little more or less tomato paste, to your liking. 2. Add sausage and cook about a minute. Alternatively, if you have time, saute the sausage separately in oil for more flavor and then add it to the broth at the end. Add in eggs and poach a few minutes. 3. Top with basil and season to taste with salt and pepper. 4. You can still have oatmeal! After all, oatmeal is supposed to be sweet. Everyone knows that. Like the sky is up. Like dogs are better than cats (sorry cat lovers but it’s a fact). And like bacon is the greatest food ever. It’s just a law of Nature. Then again, who would’ve thought butter and coconut oil go so well in coffee?! Well, the same goes for savory oatmeal. The first time I tried it, I was hooked. 1. Soak one part oatmeal to two parts warm water overnight. Add 1 teaspoon whey, yogurt or a squeeze of lemon juice. This will make the oatmeal more digestible and it will also cook up very quickly. 2. Drain water and add chicken or beef bone broth and a chopped clove of garlic and simmer for about five minutes. 3. Season to taste with salt or soy sauce and any type of hot sauce you like. You can liven things up by adding all sorts of veggies, herbs, spices, and even nuts and different meats. And eggs ALWAYS work well. Add a hard-boiled egg, top with a fried egg or poach an egg in the broth while simmering. Once oatmeal is done simmering, add a dollop of worcestershire sauce and top with a fried egg (or two) and sriracha. Add some chopped chilies for some extra spiciness. Alternatively, exclude the sriracha if you’re not a fan of spiciness. Another common Burmese breakfast is a simple plate of boiled rice with peas and peanuts. Sounds a bit dull, I know, but for whatever reason, peas and peanuts complement each other beautifully. Add frozen peas to simmering oatmeal or fresh peas towards end. Top with peanuts. Season to taste with salt or soy sauce. Note: A drizzle of sesame oil and salt rounds this out into pea-nutty perfection. What sounds like a better way to start out your day on a bone-chillingly cold winter morning? Cold breakfast cereal or a steaming bowl of nourishing broth? Get More Broth for Breakfast Recipes! 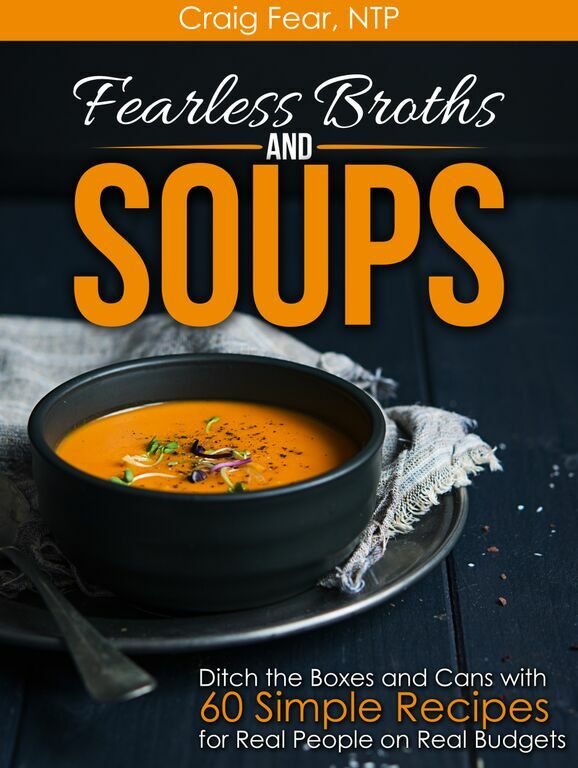 The recipes above are just a small sample of the broth for breakfast recipes in my new book, Fearless Broths and Soups: Ditch the Boxes and Cans with 60 Simple Recipes for Real People on Real Budgets. But there’s a lot more to it than just broth for breakfast. Just like the broth for breakfast recipes above, all of the recipes emphasize simplicity. They’re geared to all you stressed out moms and dads, workaholics and non-cooks trying to figure out how to eat well with limited funds and time. And these days, that’s just about everyone. Craig Fear is a certified Nutritional Therapy Practitioner (NTP) who specializes in helping others with chronic digestive issues. He is the founder of the website Fearless Eating where he shares recipes and digestive health tips. He is also the author of three books, The 30-Day Heartburn Solution, Fearless Broths and Soups, and The Thai Soup Secret.